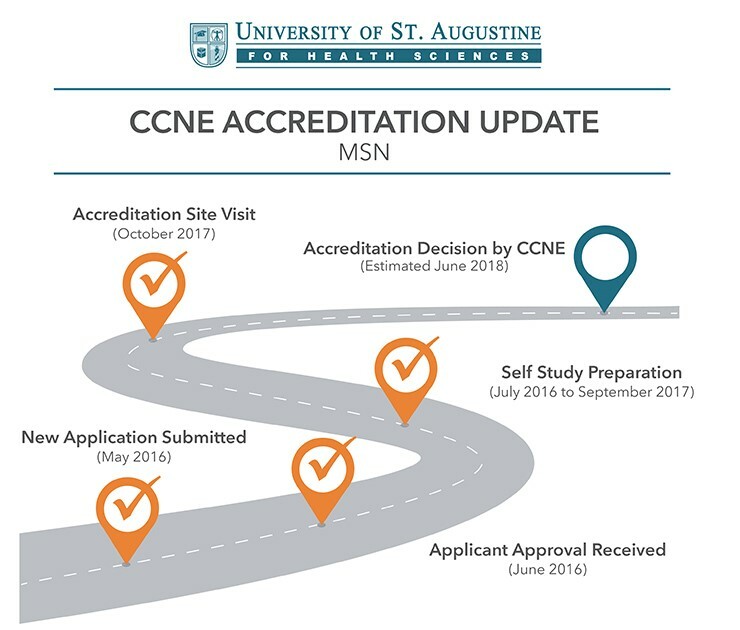 As part of the process of pursuing initial accreditation from the Commission on Collegiate Nursing Education (CCNE) for the Master of Science in Nursing (MSN) program, the University of St. Augustine for Health Sciences completed a comprehensive self-study and hosted CCNE reviewers for an onsite evaluation on the St. Augustine campus in October. As a follow-up to this visit, USAHS has received the Evaluation Team Report on the Accreditation Review of the Master of Science in Nursing at USAHS. This report outlines the visiting team’s accreditation recommendation and will be reviewed by the CCNE Board at its meeting scheduled in May. The university anticipates notification of an accreditation decision in June. The online MSN provides nurses with the flexibility to meet their busy schedules with 24/7 access to online courses, innovative learning resources, optional on-campus experiences, and the ability to complete practicum requirements in their home community. In addition, the program provides students with access to a vast network of renowned university faculty and interprofessional alumni nationwide.